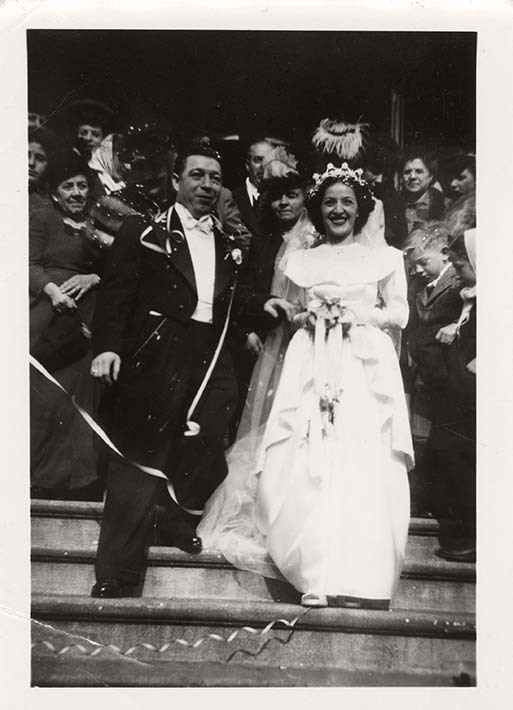 This is a black and white snapshot of Antoinette (Toni) Ciccarelli with husband Patrick Ciccarelli on their wedding day, November 16, 1946. They are standing on steps, presumably of a church. Patrick is wearing a black suit, a white shirt, a white bowtie, and black shoes. He is touching his bride's arm and smiling off to the right. Toni is smiling at the camera, holding her bouquet. She has on a long sleeve wedding gown with a ruffle decoration on the bust and on the skirt. Her hair is decorated by a crown-like hair decor and a long veil. There are lots of people behind them and there are streamers and confetti being thrown in the air.